In an atmosphere of demagoguery and baseless hysteria about foreigners and immigrants, this kind of gesture is important (not sufficient, but important). I intend to get one. But their popularity also makes me a little uncomfortable, and I imagine anyone else who pays attention to fair housing might feel similarly. 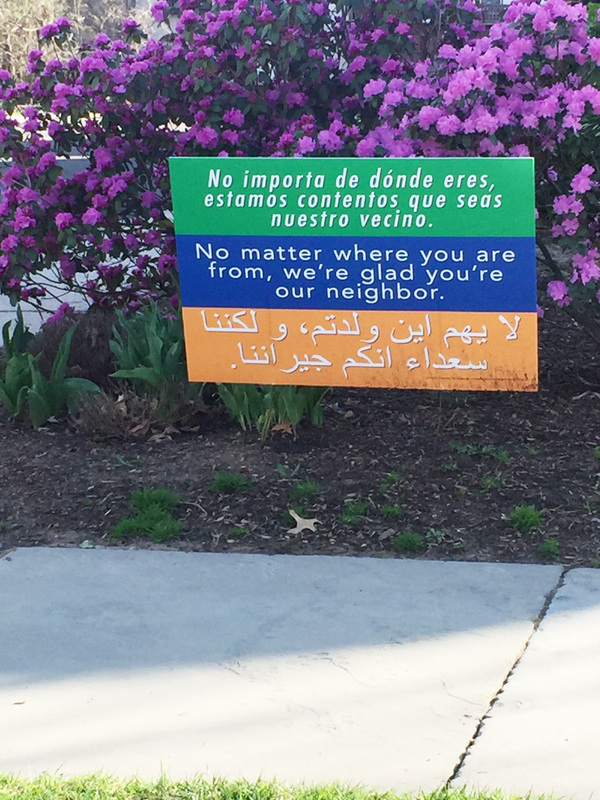 When I was on a work visit recently to Montclair, New Jersey, where Shelterforce's office is located, I saw these signs all over the place—on churches, lawns, and business windows. This is not surprising. Montclair is an epicenter for liberalism, well known as a haven for (upper class) interracial couples, and the home of multiple former Obama administration officials, New York Times higher ups, foundation officials, and the like. Seeing those signs everywhere made me smile. And it also made me cringe. Because while the makers of the sign meant “what country you’re from,” what the sign says is “no matter where you're from,” and I know that for most of these folks, that actually isn’t true. They'll swear it is, but their actions will show otherwise. And it's definitely not true if you are hoping to become their neighbor by getting a unit in a proposed affordable housing development, which often get opposed there just as energetically as they do in much more conservative ‘burbs. Granted, Montclair is not alone. In any neighborhood that primarily has homeowners, NIMBY reactions are predictable and loud, regardless of political affiliation or ideology, to any development that might change the class makeup of a neighborhood, even slightly. Also, there is often an unspoken racial anxiety that comes along with it, with opposition couched in more acceptable terms—fear of “overloading the sewer system” or “the schools” or “traffic.” One of our most popular articles describes research on projects that got approved over objections like these, showing that most of the concerns turned out to be baseless. Sometimes the veneer of politeness is even thinner. As John Henneberger recently wrote, the U.S. Department of Housing and Urban Development has ruled against the city of Houston because it was in violation of the Civil Rights Act for canceling the construction of an affordable housing development in a predominately white neighborhood. Houston Mayor Sylvester Turner is vowing to defy the ruling. Fair housing got a little bit of national attention when Ben Carson was first nominated to be secretary of HUD, and people scrambled to figure out if he had any experience with housing beyond living in it. Turns out his major declaration on the subject was an op-ed in The Washington Times calling efforts to enforce the Fair Housing Act social engineering. What many people don’t know is that another possible candidate who had been floated for the HUD position was Westchester County Executive Rob Astorino, who has, like Mayor Turner, actually fought HUD tooth and nail to defy the law and consent decrees to allow Westchester towns to keep themselves segregated for years. We’re used to the hypocrisy of supposed advocates of small government wanting to interfere with women’s reproductive choices and in everyone’s bedrooms. We don’t talk as much about the irony when champions of reducing regulation come to the impassioned defense of regulation in the form of zoning, whose only purpose is to make it hard to build housing that “the wrong sort” could afford. Perhaps we don’t talk about that so much because an awful lot of liberals agree with them when it affects their own neighborhoods. Signs of Hope for Fair Housing? There is some modest good news about the trends on the racial integration front—more neighborhoods are integrating than resegregating, and multi-ethnic neighborhoods, while still a tiny fraction, are becoming more stable, not merely the transitory places they were once assumed to be. So we should not assume this state of affairs is unchangeable. I don’t want anyone to take down signs about being welcoming to neighbors from everywhere, or to stop prioritizing the real and present danger facing our immigrant neighbors (who need affordable housing too, by the way). But I do wonder if those signs, and the sentiment behind them, could provide openings to chip away at NIMBYism. Could we rally people to the causes of fair housing and inclusionary neighborhoods by gently inviting them to walk the talk that's been posted on their lawns? A version of this article first appeared in The Alt. Thanks for this thought piece. I think the same thing all the time! The description of Montclair in the 1st paragraph of the “No Matter Where?” section is simplistic. Seven of our schools qualified for Title 1 funds in the 2016 FY. The obvious qualifier to the sign’s message is that one can afford to buy or there are rental options in the neighborhood. Thank you for this. I agree with your sentiment. Related, I have friends and neighbors doing social justice/advocacy work who choose not to live in more-diverse (race/class) neighborhoods so their children can go to “good” schools (or they send them out of the district). At my office—the Fair Housing Center of Southeast and Mid Michigan—we are working on reinvigorating our WIMBY pledge from 1994: Welcome In My BackYard. I hope you’ll check it out. More materials will be released soon. If only 7 of your schools have at least 5% percent low-income students, I think you’ve made my point for me. Montclair has just over 7% poverty and that rate has gone down consistently over the decades because of people being priced out. It is not a requirement that a town have zero poor people for it to have a problem with being resistant to economic inclusion and maintaining a range of housing types and price points.